When people understand themselves, they realize that they are not just bodies, minds and senses. They discover that they actually create all experiences, they discover themselves as a Creative Consciousness. Not as simply an observer of experiences but as a creator of experiences. Such people discover that they create not only experiences of outer world but also the thing we call “memory”. Each moment they create all their experiences and all their memories from scratch. They feel their Creative energy and supreme bliss. Also they feel immense vibration which appears in different shapes. This leads them into a quiver or trembling close to a horror. At the same time they experience supreme bliss. They realize that the Truth is Horrifying and also that the Truth is Blissful. 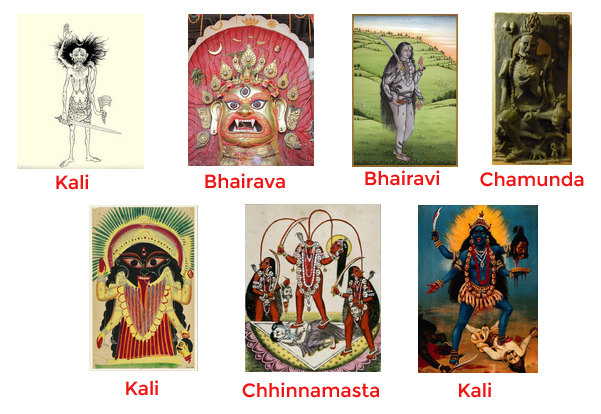 The word in Sansktir for “Horrifying” is “Bhairava”. Because the revealed Thuth is Horrifying, the God got the name “Bhairava” which means Horrifying and causing a Quiver. Shakti is the Sanskrit term for power, ability and energy. This shakti, this divine ability to create experiences is this Quiver of consciousness (or of psyche). Also people come to this quiver when they direct their attention to their ability to create experiences. And this quiver is close to a horror, and it is also a quiver of bliss. This horrifying and blissful quiver of the consciousness finds expression in such images as Bhairava, Kali, Bhairavi, Chamunda, Chinnamasta. These images reflect Divine experience and supreme bliss because they are closest images or associations appearing in people’s minds when people get into their essence and reveal themselves as God and find their Divine power which is terrifyingly blissful vibration-quiver of consciousness which creates all experiences of all living beings. These images of course are not images of the God. The God cannot be limited by any image. The God is indescribable. However the closest description of the God and Divine energy is Terrifyingly-Blissful Creative Quiver from which direct divine manifestations come forth. They are big number of deities and they reflect this Terrifyingly-Blissful Creative Quiver in themselves.